Yoga and nature connection have each helped my own physical and mental well-being a great deal, which is why I feel called to share these valuable practices with others. I would love for everyone to have financial access to my services. Unfortunately, not everyone is in a stable financial situation, most grants are available only to non-profit organizations, and I generally need to charge fees to support myself. I feel that sliding scale pricing is a doable step towards making wellness services more accessible. Depending on the cost of running a particular event and the number of people it is suited to, I calculate a reasonable per person fee - the top fee on the sliding scale, one that is nourishing and fully sustainable for myself and my business. The sliding scale extends below that fee out of recognition that the full fee will not be accessible to all and that all contributions and participants are valued. "If paying for a class, product, or service would be difficult, but not detrimental, it qualifies as a sacrifice. You might have to cut back on other spending in your life (such as going out to dinner, buying coffee, or a new outfit), but this will not have a long term harmful impact on your life. It is a sacred sacrifice in order to pursue something you are called to do. If, however, paying for a class, product, or service would lead to a harmful impact on your life, such as not being able to put food on the table, pay rent, or pay for your transportation to get to work, then you are dealing with hardship. Folks coming from a space of hardship typically qualify for the lower end of the sliding scale. I find the idea of sacrifice versus hardship to be a very useful nuance when talking about class and access because it recognizes and respects that paying for something might still be a challenge even if it is just a short-term one, while giving appropriate space for those who are dealing with financial hardship." 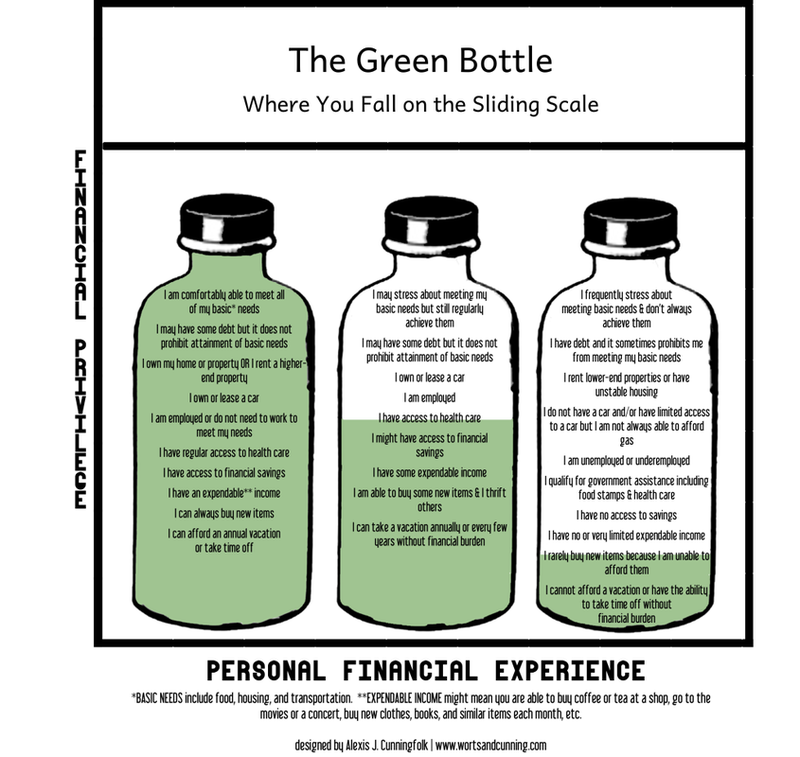 I am using the sliding scale system based completely on trust and the hopes of building both community and a successful and sustaining business. My fees do not involve any application process or proof of income. During payment, each participant is encouraged to choose the fee that feels right for them. The information in this blog might not cover every consideration applicable to your situation, so it is just a starting point. So, why aren't all Rooted Heart events offered on a sliding scale? Great question! Sometimes there are other businesses involved who help to set the pricing of a certain event or too many behind-the-scenes fees and variables at play to make this flexibility possible. It is quite possible that my payment structure might shift over time as my business goals or personal needs change. But accessibility and community building will always be priorities at Rooted Heart. Energy exchange options are sometimes available for special events when YOU have the skills to make our time together even more awesome! Depending on the scope of a certain event, I might make a full or partial energy exchange available. These options are typically dedicated to makers and movers who can contribute either a service / product to add a special enhancing touch to the quality offerings already planned, or their time and effort to help an event run smoothly. These spots will be determined based on a mutual agreement of your contribution and give priority to those who might struggle to afford the sliding scale. I would love to receive your suggestions on how to make my wellness services more financially accessible. Please leave your comments and questions below!